We very much enjoyed our tour because our guide was so good. He knew so much about the history of Bath and explained it all in an enthusiastic way. What you really appreciate is that the guides point out things you probably wouldn’t have noticed even though they’re right under your nose. 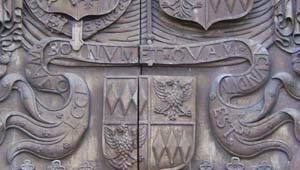 For example the ancient doors of Bath Abbey have a story to tell in the carvings. When you join one of the tours, you find yourself visiting all the tourist locations including the Abbey, the Circus, the Royal Crescent, the Assembly Rooms and many other historic buildings. There’d so much to see in Abbey Churchyard itself that we spent around half an hour of our tour here before we moved on. The big highlight for us was the trip inside the Bath Assembly Rooms, which was part of the tour we were on. It’s worth pointing out that the tours do vary depending on which guide is leading them and access to the Assembly Rooms is not always possible. The guides are volunteers and do not accept tips, although they definitely deserve them! Tours operate daily, starting at 10.30am and at 2pm although there is no afternoon tour on a Saturday. From May to September addition tours operate on Tuesdays and Fridays at 7pm. No pre-booking is necessary for individuals, but groups of 12 or more should pre-book at least 4 weeks in advance by calling the Mayor’s office.